Around the globe, scientists are conducting research on orcas. They often go out on the ocean to collect data on the animals. However, they do not always have to collect all this information themselves. Citizens can also make a significant contribution, for example by sharing their sightings. This help from citizens in scientific projects is also referred to as ‘citizen science’. Although the term ‘citizen science’ is becoming more and more common these days, it is not a new phenomenon that citizens are involved in orca research. In the 1970s, public networks were formed in the area of Vancouver Island where people could share their orca sightings with scientists by telephone. In 1982, the Icelandic herring fishermen were asked to report the orcas they encountered, to make a estimation of the population size. Also for many years, the New Zealand based Orca Research Trust has a special telephone number where citizens can report their sightings. Especially in areas that are difficult to access or where orcas are encountered unpredictably, help of citizen can be very valuable. Scientists often use photographs of the orca’s dorsal fin and saddle patch in their research, because these help to recognize individuals. Photos made by citizens can be a useful addition. These photos can, for example, be added to photo catalogues that are used by the researchers. 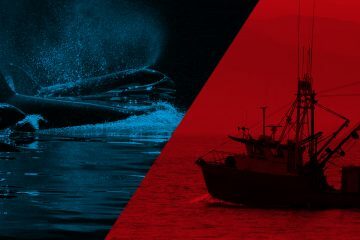 Norwegian Orca Survey made a special website with photos of all their known individuals from Norway. It is also possible to submit your own photographs. However, photos taken by citizens can mean more than an addition to a photo-identification catalogue. By comparing photos between different locations, the travel range of orcas can sometimes be determined. In 2008, a pod of orcas was encountered in Abu Dhabi. 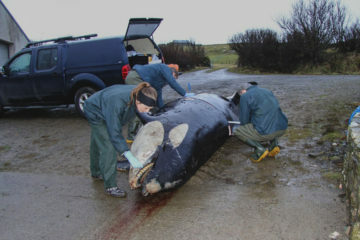 The people who saw them managed to take photos of some of the orcas and these photos appeared in local media. 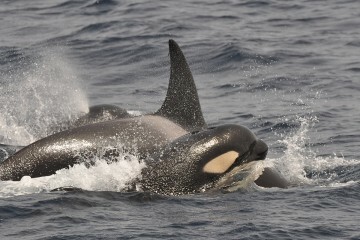 Later on, the Orca Project Sri Lanka could match two of those orcas with individuals sighted at Sri Lanka in 2015. The orcas travelled a distance of 3.300 kilometers; information that would never be obtained without citizens. It is already known that other orcas travel between locations. 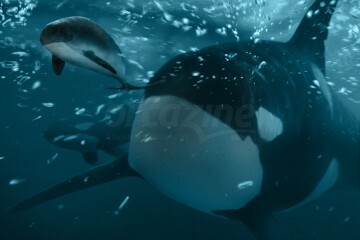 For example, some orcas have been photographed in both Iceland and Scotland, including the pod of Mousa. There were several observations of this orca pod in Scotland in the summer of 2016. 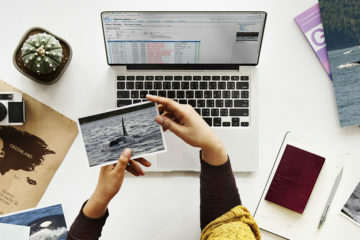 Researchers of the Icelandic Orca Project could follow the travel pattern of these orcas through reports from citizens and local organizations on social media. The group was seen north of the Scottish mainland in May. In July, the group was seen around Orkney, Fair Isle and the Shetland Islands. And in August and September, they stayed at the Shetland Islands. Photos taken by people that encountered the orcas confirmed the predation on gray seals and a black guillemot. Even the gender of one of the orcas could be determined by one of the photos. One of the challenges with citizen science is to connect citizens and scientists. Currently, this often happens through messages posted on Facebook or other media. Citizens make many nature observations around the world. Having a dedicated international platform to register these observations can help to bring citizens and scientists into contact. Observation.org is a good example of this. Observation.org is a website where everyone can submit their nature observations. In addition to the international version, there are separate sub-websites for observations in the Netherlands and Belgium. The added observations are collected in a digital system and shared publicly. This way, everybody from hobbyist to researcher can use the collected data (only commercial use is not allowed). The observations are an importent tool for conservation, research, policy, education and experience. The people behind the platform are ambitious and strive for a reliable, open and user-friendly platform. In order to add new sightings on Observation.org, a user account is required. Then, you can start a new observation by filling in various fields such as species, date and location. In addition, it is possible to explain more about the sighting and add photos or audio. It is also possible to add new observations directly while being out in the field, by using the ObsMapp (Andriod) or Iobs (IPhone) app on your smartphone. With these apps you can submit you sighting without the need for an internet connection, the phone sets the GPS and date for you. Added observations are checked by so-called validators. They look at the supporting evidence such as photos and the likelihood of the observation. If the sighting is correct, they add a green check mark, and if there is any doubt they might ask for additional information. This creates a database with reliable data. Scientists themselves can also make an account, so they can contact the observers (providing that the user has not disabled this option). But besides the use for research, it is also interesting for citizens to see each other’s observations. 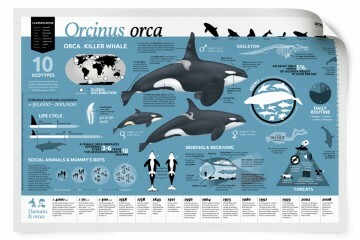 It is possible to specifically search for orca sightings on the website. The observations can be viewed as a list, with various selections being possible. The observations between a certain time frame can also be shown and accessed on a map. 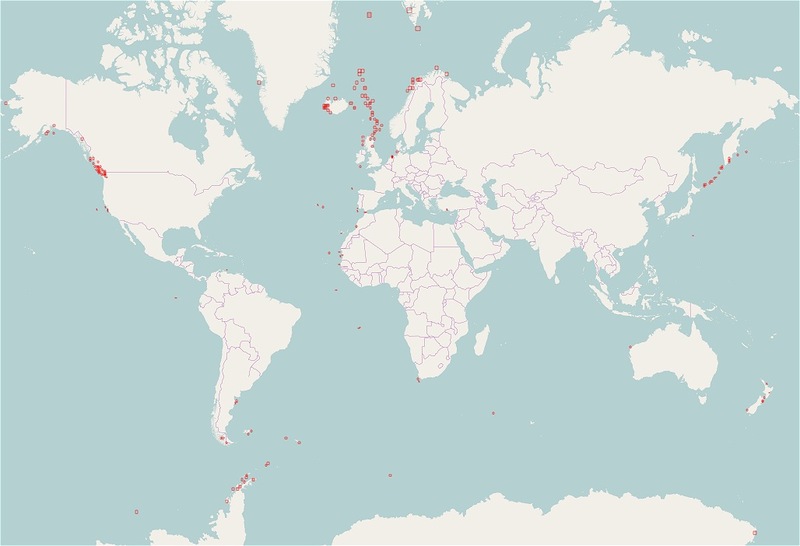 Orca hot spots are immediately visible on this map of the world. This includes Vancouver Island, the west coast of Iceland and northern Norway. Additionally, the website also contains general information, submitted photographs and statistics of the selected species. A remarkable line with observations is visible in the North Atlantic Ocean. Many observations are reported between the Shetland Islands and Jan Mayen Island. A large majority of these sightings can be explained by a specific cruise. Every year around May/June, two nature cruise ships depart from the Netherlands via Jan Mayen to Spitsbergen. 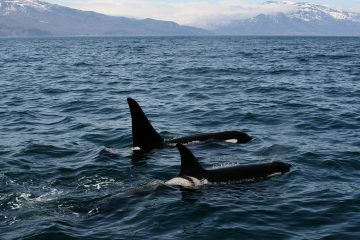 During those cruises, orcas are regularly encountered and the people on board often register the sightings on Observation.org. In 2016, Thomas van der Es was on board one of the ships on behalf the travel organization Inezia Tours. 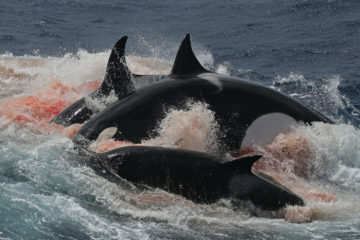 The first group of orcas was observed on June 1, east of the Faroe Islands. Thomas describes his encounter: “The animals were supposedly involved in a ‘killing’. Many birds surrounded the group, including some storm petrels.” There was also a young orca in the group, who stayed close to the mother. The observation by Thomas can be viewed here. 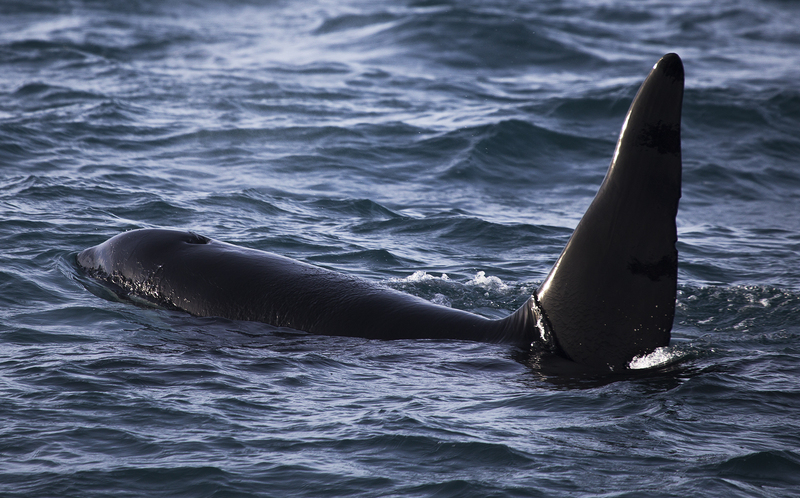 It was a successful journey, with multiple orca sightings, including a group east of Iceland. Sometimes, a photo does not even have to be of high quality to recognize an individual. The West Coast Community, an endangered orca population that consist of less than ten individuals, can be found around Scotland and Ireland. One of the orcas from this population has a big notch in his dorsal fin, making him very easily recognizable. 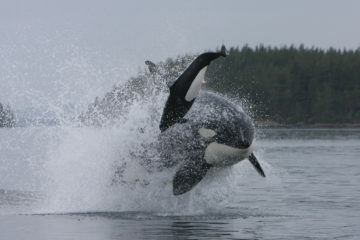 This orca is known as John Coe. 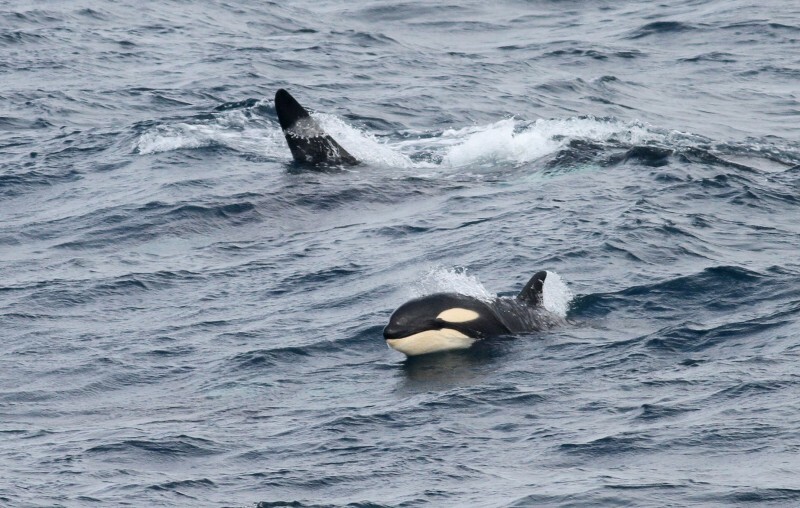 On August 5, 2014, Jefta Leeuwis saw a group of four orcas in the north west of Scotland. They did not swam close to shore, but could be followed with a telescope for about 20 minutes. A photo that was added to the observation shows the recognizable dorsal fin of John Coe. Jefta’s observation can be viewed here. 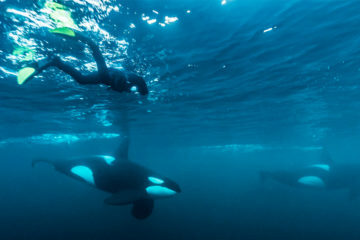 The west coast of Iceland is also a location with many orcas sightings reported on the website. One of these observations was made by Yannick Bel. During a whale watch tour on February 16, 2017, he saw many groups of orcas spread out over a large area at the entrance of Breidafjordur. His observation can be viewed here. Now and then, orcas are seen on unusual locations, like near the coast of the Netherlands. The news of an orca swimming north of Lauwersoog spread on the evening of June 23, 2010. Also Merel Zweemer received this news and decided to have a look. She could see the orca swimming far from shore. Shortly thereafter, a boat from the Dutch Ministry arrived with a team of the Dolfinarium. 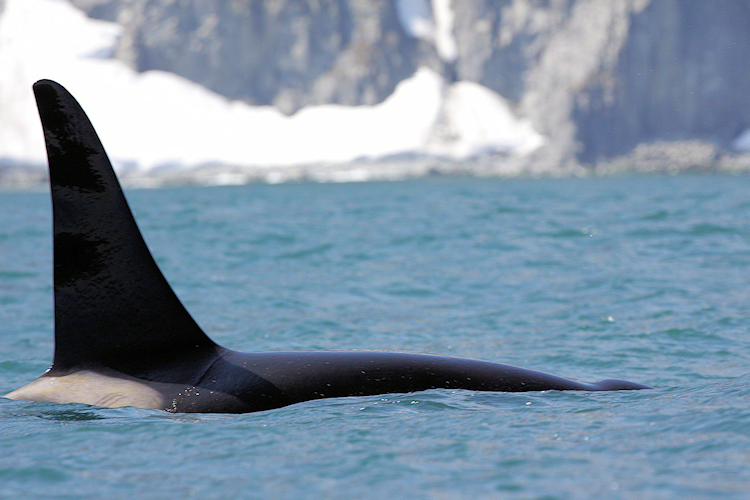 The orca turned out to be a young and weakened individual and was captured to offer help. She was lifted onto the boat and transported to the harbor. 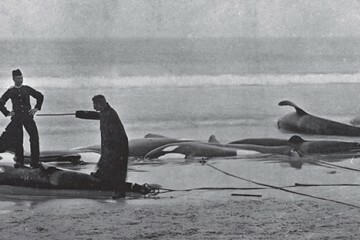 After arriving in the harbor, the orca, who later was named Morgan, was placed in a truck and then moved to the Dolfinarium in Harderwijk. Merel’s sighting can be seen on the Dutch version of the website. Some people are lucky to have seen orcas in many placed around the world. Observation user Jan Dekker is one of those people. He made three large cruises at sea, and therefore his observations were not on the most obvious locations. In 2011, he traveled from southern Argentina across the Atlantic Ocean to Madeira. 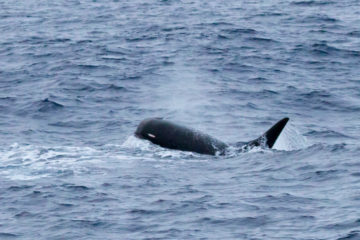 He saw orcas north of Saint Helena and west of Mauritania. One year later, he went on a cruise in eastern Russia, where he traveled from Petropavlovsk, via the Kuril Islands, to Sakhalin. During two weeks, he had many orca sightings and saw dozens of individuals. One pod in particular has made an impression on him. “We saw a group of about 10 individuals that do not migrate, but stayed in the same place at the Kamchatka coast year round. They feed on Steller sea lions that are sitting on a rock,” Jan Dekker explains. He also encountered an orca on a cruise from New Zealand to Japan in 2015. And at the end of 2016, another observation followed while visiting the Galapagos Islands. Ofcourse, my own orca sightings are also added to Observation.org. They can be viewed here. Did you become enthusiastic? Then sign up and register your observation on the website or with the app, and maybe your sighting will play an imported role in orca research. You can register via this link. Thank to Martine Lemmens of NatuurBank Nederland for her explanation of Observation.org, and all the observers for contributing to this article.